Hair, Skin, Nails- choose the best in the biz! There are a lot of places to get your hair, nails, and makeup done. Rochester, NY, is no exception. Rochester’s bustling Park Avenue neighborhood is home to many of these salons. But how do you choose? How do you choose the best salon in Rochester, NY? Choosing a salon that can fulfill all your beauty needs can seem like a daunting task, but it doesn’t have to be. That’s where we come in. Trü on Park offers a comfortable, welcoming environment in which you can relax and let us take care of the rest. Our tight-knit team of stylists at our cozy Park Avenue salon want to exceed your every expectation and provide the finest salon experience in Rochester, NY. From the beginning of your service and even after you walk out the door, we are here for you! At Trü on Park, we take great pride in the work we do every day and strive to be recognized for that. 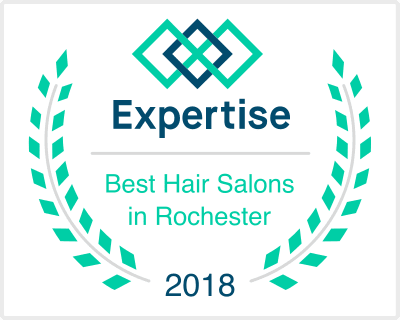 In fact, recently we were honored to be featured on Expertise.com’s list of the 19 best salons in Rochester, NY! Over 60 businesses were considered for this informative list that measured the various salons based on factors like reputation, credibility, experience, and professionalism to determine the top contenders for best salon in Rochester. We can confidently say that at Trü on Park follows through on all the above and more. That all being said, we want you to see what we are about first-hand! Whether you are new to Rochester, NY, or are just ready for a change of pace in your beauty routine, be assured you will get nothing but the best here at Trü on Park. So give us a call, shoot us an email, or just head down to Park Avenue and come on in. We can’t wait to meet you! For more info call 244-0044 or email info@truonpark.com.